Studio 1 is our large warmed studio space. The temperature is kept between 85 and 90 degrees to help warm up the muscles and encourage a deeper stretch, while still keeping everyone safe. This beautiful space was once a warehouse and still boasts 13 foot high ceilings. Studio 2 is a smaller unheated space and holds classes such as Gentle Yoga, Kid's Yoga, Restorative Yoga, Teacher Training and workshops. Coming soon......... Locker Rooms are currently under construction but will soon feature cubbies, vanities, and showers for your convenience. I have always loved pursuing a challenge, which is why I avoided yoga for so long. I wrongly assumed it was something that was easy. I finally came to my senses after a friend pushed me into a studio and I left exhausted and exhilarated. 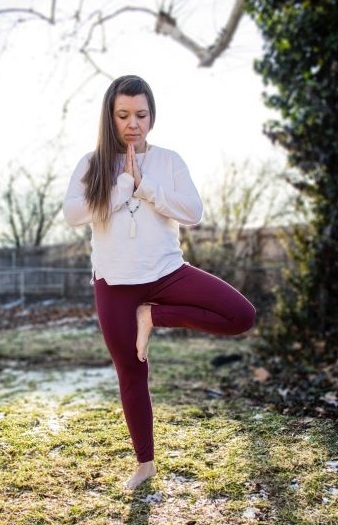 After falling in love with yoga and letting it change me in so many ways for the better, I knew I wanted to help others see the good it could do in their own lives. I completed my teacher training through YogaWorks, became a registered yoga teacher with Yoga Alliance and have been honored to teach ever since. I believe that yoga is being able to get your body and mind working as one towards a goal that will both challenge you and change you. It is accepting where you are, striving to be better than you are, and knowing it is an ongoing journey you will never finish. This is how I came up with the name Limitless Yoga. It reminds me that no matter how advanced you may become, there is always something more to strive towards. I began practicing yoga 3 years ago, primarily for stretching. My first corporate job had me sitting in a chair 8 hours a day, and my back hurt constantly. In addition to solving my back pain, yoga helped me lose and keep off thirty-five pounds. I find teaching to be incredibly rewarding. I love helping students improve their form, learn new poses, and see their confidence grow. I strive to always have a warm and welcoming yoga class and hope you'll join me! I began yoga as yet another workout challenge. The increased strength and mobility I gained were immediately helpful in my workday ergonomics. With time, the energy of the physical practice gave way to an increased spiritual and mental focus that has helped me cultivate a calm environment for the patients and staff of my dental practice. I have completed two 200 hour teacher trainings both with the Institute of Interdisciplinary Yoga Studies and Yoga Works. Additionally I have attended courses with others such as Doug Keller, Noah Maze and Ray Long. I enjoy teaching and helping others find strength and awareness in their own bodies and minds. I started practicing yoga when I was in college and was looking for a way to stay active and relieve stress. After college, I continued to practice yoga as a way to stay in shape and feel good in my body. I really began to enjoy the challenge that it gave me physically and the focus and clarity I felt mentally and emotionally. I initially began my teacher training to deepen my own personal practice and to develop a good foundation in yoga. But by the end of the training, I decided I really wanted to teach yoga as well. Yoga has had such an amazing impact on my life, I want to be able to share that with other people. I really love being able to guide people through a practice that brings me so much joy. I'm excited to share my practice with you! I'm a photographer and yoga teacher with a slight obsession for cats. I've been teaching yoga for 2 years. I'm just in LOVE with heated yoga flows. Yoga means self love, mindfulness and strength for me. About 3 years ago I walked into the heated room and was totally terrified. Now, I can't go a day without yoga! It's a wonderful accepting community that I am so proud to be a part of. I can't wait to see you at a class! Yoga started as a last resort for me. I was facing medical problems that were expensive, painful, and mentally draining. I was told if I wanted to continue working out I needed to find a way to do so without sweating. So, when a friend invited me Kelsea’s yoga class, I figured why not? At first it was just an outlet, a way to stay busy and active. Before I knew it, yoga had changed my life. The yogi lifestyle helped me stop all medications, relieve most of my symptoms and just breathe. I learned how to relax, to be more positive and I feel like the best me I have ever been. I’m a homeschooling mom of three and life gets...hectic. Yoga calms me and makes me feel strong and capable. Yoga has become a focus for my whole family. My three year old does yoga and so does my 84 year old grandfather. And every one in between. I tell people every day - many complete strangers - that they need yoga. I can honestly say that yoga has taught me to be a better me. It has taught me to pay attention - to my body, to my world, to my people - all of it. It slows you down, refocuses you, and gives you a practice you can come back to any time you want. I love teaching yoga as much, or more, than I love practicing. It is such a joyful process to be apart of someone else’s yoga journey. I enjoy hearing how yoga has enhanced someone’s life because that’s the magic and truth - yoga always makes a day better for someone.